Private Townhome with full access to the Mauna Lani Resort Amenities. Golf Villas, in the Mauna Lani Resort, is a gated community located on the famous Mauna Lani South Course. It has its own resort style pool, spa, and fitness center and the premium 87 luxury villas are surrounded by beautiful gardens and lawns. The views of the Kohala Mountains and Mauna Kea are breathtaking and within the resort are the Mauna Lani Bay Hotel and the Fairmont Orchid. This beautiful townhome, H4, looks up the 10th fairway of the South Course and down the 9th fairway with the luxurious homes of 49 Black Sands Beach immediately across. You can relax on the upper lanai and watch the golfers pass by or the sun set in total privacy. The patio opens onto a lush lawn which extends along the side of this spacious end unit which offers three bedrooms, three full bathrooms plus a loft/den located upstairs and sleeps six. The great room features high ceilings with plenty of comfortable seating and a separate dining area. The master bedroom with its own lanai has a king bed and a private bath with a separate shower, bathtub and dual sinks. The second bedroom upstairs features a queen bed and a private full bath. The third bedroom on the main floor has a queen bed, and a full bathroom located adjacent. There is also a den/loft upstairs with a desk with a view which will make it a pleasure to catch up on any emails or correspondence while in paradise. All bedrooms have flat screen TVs with Netflix access. The kitchen with granite countertops, offers all the chef's essential tools, and a built in BBQ/Stainless steel kitchen is located on the outside patio. The townhome has been recently renovated with new tile, carpet, paint, furniture, and decor with an island style and open floor plan, giving you a spacious, relaxed, and comfortable vacation environment. The living room and upstairs loft have HD flat screen TVs and there is also wireless internet throughout the home. Located nearby is the private Mauna Lani Beach Club which is available to guests. This is a private white sand cove which you will have access to with a key card provided. The beach has great snorkeling and swimming and chaise lounges available for guests as well as a lovely restaurant where you can get a light lunch or a full dinner. The historic fish ponds are near and you will likely see turtles sunning themselves on the nearby rocks. There are historic parks and walking trails within the resort which you can explore at your leisure. Not far from Mauna Lani resort is Hapuna Beach State Park, one of the top rated beaches in America. This is a half mile stretch of white sand beach where the boogie boarding can be excellent. There are the two championship golf courses right at your doorstep, the Mauna Lani South and North, as well as many other courses within a short drive including Mauna Kea and Hapuna. The Mauna Lani Spa offers tennis, a weight room, sauna and lap pool. The Shops at Mauna Lani offer dining at Tommy Bahamas and Ruth Chris as well as a number of unique stores and a well stocked supermarket with a fine deli for your grocery needs. There is also fine dining at both the Mauna Lani Bay and Fairmont Hotels and at the Clubhouse. A short drive away is the King's Shops and the Queen's Marketplace, also offering a variety of shops and restaurants including Roy's and The Macaroni Grill. We are certain that you will have a wonderful time on the Big Island and hope that it will be at our home in paradise. Washer and dryer are located in the laundry room off the upstairs loft. Parking is available in front of the garage. Steps away is a shared hot tub and a resort style pool. The BBQ area features a built in sink and granite counter tops. Please, no pets and no smoking in the unit or on the lanais. Full or limited housekeeping is available. This condo is very nicely appointed, in a quiet, peaceful setting with great access to local sights. 7 miles to amazing Hapuna beach and on-property access to a quiet black sand beach, plus access to the development’s private beach and pool. Plenty of nearby restaurants and a short drive down to Kona. We had a great visit and the house was a great base of operations. Lots of beach supplies were available and the ability to do laundry was a huge benefit. We would gladly stay here again. Our family Loves the Beach and Golf. Mauna Lani Golf Villas is a Great Solution. 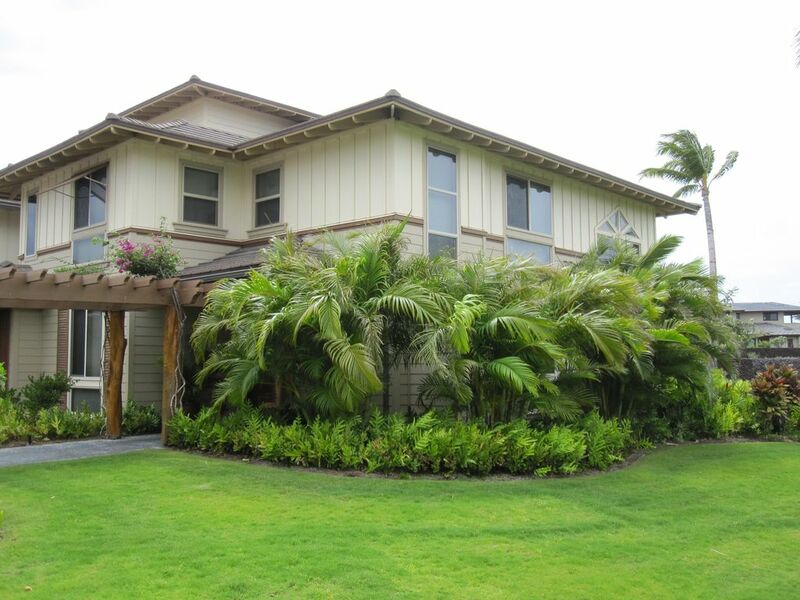 Located on the course and within walking distance to beach and ocean views at Mauna Lani. The layout of the Home was perfect for our family of four - giving each teenager their own room and parents privacy as well. Lanais are perfect for evening grilling or sitting in sun and/or shade. The amenities within the Home were perfect ! On a family vacation, overall this was a great villa to stay at. Each bedroom had a nice bathroom with nice shampoo, conditioner and soap. Every basic need was accommodated for, from spices to bbq equipment. The furniture was also clean and comfy. It was a great place to go back to after a day out. Views of lava rock and the golf course. It is close to a great beach with good snorkeling, although you do need to drive 5 mins to it. The beach includes chairs and chair cabanas which was really nice too. There are plenty of places to walk and things to do in the area as well. My hubby usually has issues with pillows, but he really liked the memory foam pillow. Will book the villa again if staying on the big island again. Great location! clean, quiet and spacious, don't hesitate! This was our second time in Hawaii, but our first time on big Island. Communication was great from the beginning, we got answers for our questions quickly, the directions and instructions to the house where easy and complete. The unit is very clean, and was large enough for four adults and two teens. A/C works great but we didn't need it that much because of the nice breeze that comes in the house. The area is quiet and close to everything, including groceries and great restaurants. The location in Mauni Lani is a good base to visit all the island has to offer. Thank you for a memorable visit! We loved this 3 BR 3 Bath Villa in The Golf Villas at Mauna Lani. It was perfect for 3 couples. H4 is in excellent condition inside and out and very well appointed. Great living areas, kitchen and outside patio with a built-in barbecue. Kitchen was very well stocked from paper towels to the pantry basics of spices, oils, salt & pepper. Central air and fans in all areas. Bicycles, beach chairs, pool floats and plenty of beach towels all supplied. The whole Mauna Lani resort area is beautiful. Lovely calm beaches, warm clear blue/turquoise water and lots of fish and turtles to see. Plenty of excellent golf available and The Shops at Mauna Lani are only a few minutes away. Also included is access to the private Mauna Lani Beach Club with its beautiful white sand beach, bar and restaurant. Victoria and Christian our concierge were both wonderful to work with. I'm looking forward to our next visit! Thank you so much...we look forward to hosting you again! Mahalo! This was our first time staying in a rental home vs resort/hotel property. We weren’t totally sure what to expect but our experience far exceeded our expectations. With 3 boys, having space and being in a tropical destination while having the benefits of a home was amazing. We loved being able to cook some meals at ‘home’...boys could get up and eat breakfast first thing in the morning in the kitchen and dining area, we could get up and have a cup of coffee out on the beautiful patio and watch the sun rise. We had many days of adventure, but when we returned ‘home’ if the boys wanted to still swim we could head right out the front door to the community pool. That was An amazing perk that we weren’t expecting. At night we had the option of grilling dinner or cooking dinner or going out, depending on what we felt like. The home was well stocked with everything we needed. This was also our first time on the big island, which was awesome, we loved it. We left with my husband saying we need a second ‘home’ ;). Thank you Loretta (and Victoria) for everything. Definitely great memories as a family!!!! We were so happy to have hosted your family! Thank you for the lovely review, and we look forward to having you again! $500 reservation deposit is due at the time of booking. A cleaning fee of $265 will be taken. The balance is due 60 days before arrival date. Information, directions and the rental agreement will be emailed to you. The maximum occupancy is 6 persons. Discounted rates are available for some periods for rentals over 14 days. Note: Until confirmed, rates are subject to change without notice.